Cornerback is one of the biggest areas of need for the Vols in the 2019 recruiting class. They need immediate help at that position for next year, and their top target at the position would be able to provide just that if he chooses Tennessee. And this weekend, he’ll be visiting Tennessee for the first time. 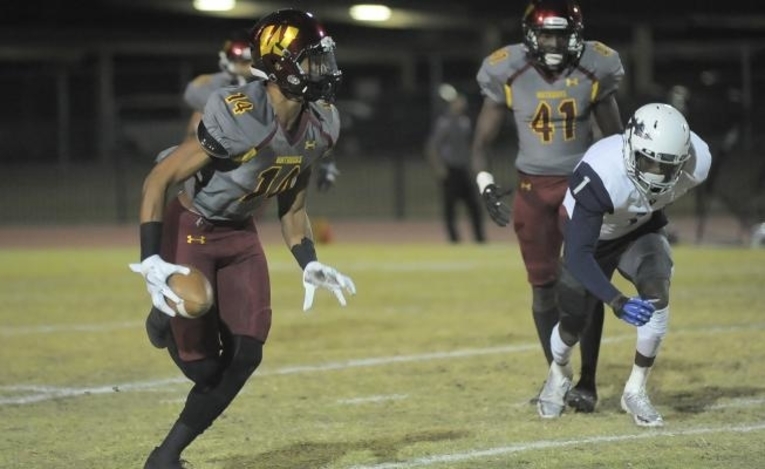 Elijah Blades is a four-star junior college cornerback who plays for Arizona Western College. He said earlier this month that the Vols were beginning to stand out to him and that he wanted to visit Tennessee soon, and now he’s following through on that. According to 247Sports, Blades is already on campus for the weekend. Tennessee offered Blades back in late February and have continued to keep in contact with him. Now he’s in Knoxville for the first time, and the Vols’ coaching staff will likely try to get the elite cornerback to visit again later this year. Blades is listed as the No. 1 JUCO cornerback according to 247Sports and the No. 3 overall JUCO player in the 2019 class. Their composite rankings have him listed as the No. 6 overall junior college player and the No. 2 JUCO corner. He holds offers from Alabama, LSU, Texas, Florida, Miami, and others. He unofficially visited Oregon last week and used one of his official visits to go to South Carolina on June 2nd. Tennessee has a connection with Blades dating back to his time in high school. Coming out of high school, Blades was a four-star cornerback from John Muir High School in Pasadena, California in the 2017 class. Tennessee didn’t offer him back then, but Colorado State, where UT cornerbacks coach Terry Fair previously coached, did offer him and pursued him. Blades ended up signing with Nebraska out of high school, but he elected to go to junior college instead of enrolling with the Cornhuskers. Now Fair is the lead recruiter for Blades at Tennessee, and that prior relationship could prove beneficial to the Vols. Blades is an incredibly athletic and speedy corner. But that speed doesn’t come at a cost of height like it does for most athletes; Blades is listed at 6-foot-2, 170 pounds but still moves with great agility. He knows how to use his large frame to play with a tough physicality, and he gets a great break on the ball. He knows how to read quarterbacks fairly well and is dangerous when he picks off a pass. He’s good at press coverage as well, and that bodes well for how he would fit in with Tennessee’s defense. In his first year with Arizona Western, Blades totaled 22 tackles, four pass breakups, an interception, a forced fumble, and an interception return for a touchdown according to ACCAC.org. He was also used as a kickoff and punt returner, returning eight kicks for an average of 26.9 yards per return and 10 punts for 38 yards. Blades plays at the same junior college as two Vol signees from the 2018 class. Four-star tight end Dominick Wood-Anderson and three-star offensive tackle Jahmir Johnson both played at Arizona Western with Blades last year. Tennessee has several high profile visitors coming to Knoxville this weekend. Four-star quarterback and current Alabama commit Taulia Tagovailoa is visiting, and five-star linebacker Henry To’oto’o is expected to come in as well. The Vols currently have two defensive backs committed in their 2019 class, but neither of them are cornerbacks. Four-star Anthony Harris and three-star Aaron Beasley are both listed as safeties, meaning Tennessee is still in the market for cornerbacks in this class. Expect Blades to continue to be one of Tennessee’s top priorities in the 2019 class.